I have spent many lunches in Rodic’s during my university days and, for me, no tapsilog ever comes close. Despite Rodic’s being around for literally over half a century now, how they serve their no frills food has remained unchanged. They are actually a carinderia/turo-turo (diner), and serve quite a selection of viands per day. The system being you point at these open chafing dishes behind a sneeze guard to choose whatever you feel like having. But I just really come for the tapsilog. 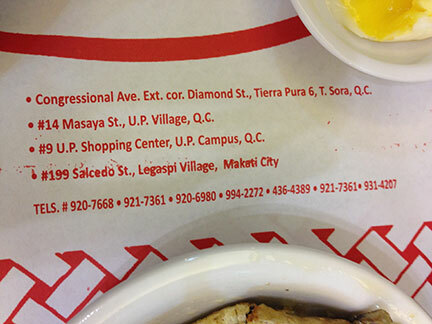 Their signature dish is typically served on a steel oval plate. They first pile on a mound of white rice (probably at least a couple of cups worth). Then top this with their tapa and a kawali-fried egg (yolk ideally still runny). Their tapa is served in tender shreds, almost floss-like. It’s dry and isn’t covered in any sauce. Sweetly scented with anise, but in itself not sweet but savory; a good thing. Which makes rationing your meat-to-egg-to-rice per spoonful quite easier. They usually have these bottles of spicy sinamak-style vinegar as a condiment and no experience is complete without that. On the aesthetics department I can say it sure looks artfully plated by an artist. By the name of Jackson Pollock. It is a mess. Without context, it just looks like everything was dumped and plopped. Daresay not too appealing to look at. But hell, there’s nothing really quite romantic to say about this dish except that its truly comforting and quite delicious. Inexpensive, too. It only takes a spoonful to make you a convert. They don’t have a lot of branches so I don’t get to go that often. But when I do, it’s a satisfying experience every single time. Again, for me, no tapsilog comes close. 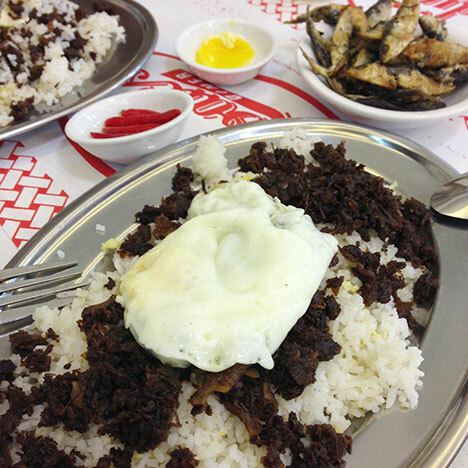 Watch a short video about Rodic’s here. 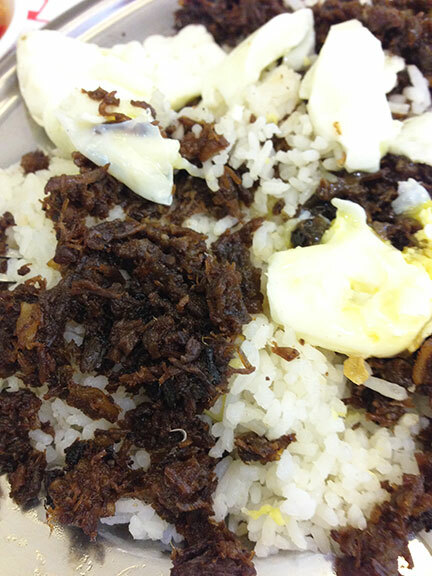 agree with you that no other tapsilog comes close to rodic's. even if it was wagyu or kobe or angus. but we could be biased by our university upbringing. hehe.